Your choice of a green – ‘Red Russian’ kale or Swiss chard – along with ‘French Breakfast’ radishes, tomatoes, basil, peppers, green onions, cucumbers, summer squashes and either broccoli or cabbage. Salad greens are missing from this list. For some of you, a break from greens might be welcome, for others, not so much. My apologies. The toll of the drought and hot weather will be most keenly felt by the absence of greens for the next two weeks. We received a farm-saving rain mid-week last week. If before the rain our pond had the appearance of a mud flat at low tide (see our Instagram page), after the rain it appears as though the tide has risen about two feet, enough to get the irrigation equipment running again, but not enough to be out of the woods. The heat and lack of rainfall caused the loss of thousands of heads of lettuce and choy and other leafy greens – in some cases to premature bolting, in others to our inability to provide water in the week after transplanting. And in one case, to the drought tolerant weeds that got to them before our cultivators. The good news is that we’ll be back in leafy greens in relatively short order. In the meantime, summer produce is coming in – including tomatoes and basil, sweet peppers and, very soon, sweet corn. Your fruit share will consist of cherries – perhaps the last of the season – followed soon by peaches and blueberries. Last week, we harvested the last of the garlic, this week, we’ll finish harvesting the early onions. Size is down somewhat, but bulb quality is good. Two of three potato fields are weed-free, and this week, we’ll clean up the third. We’ll also give the leeks, beans, beets and broccoli a good weeding. Then, we’ll irrigate the whole of it, along with the sweet potatoes and winter squashes we weeded last week. Among our other projects, Andrea will spray a biological bug killer on the broccoli, collards, kale and rutabagas this week. Our foe is the tiny flea beetle, and it’s chewing holes in the leaves of these Brassicas. Nate will cultivate the sweet corn and youngest lettuces with the Dutch hoes on his electric cultivator. TB, a young carpenter who works with us from time to time, will build workshop cabinets – eight of them – with the help of Julia, our new field coordinator. And I will finish the job of busting through the hedgerow so that the well drillers can get started. If you've been enjoying products from Lewis Waite Farm this season, you'll be interested to know that you can get involved in securing the farm's future. Here's a note from farmers Alan and Nancy Brown. We have some exciting news to share with you, as well as a request. For years we have been discussing conserving our farm and have decided that now is the time to act. We are partnering with the Agricultural Stewardship Association (ASA), our local land trust who will be purchasing our development rights through a conservation easement. The conservation easement will allow us to protect the land from development forever. Rest assured, we love our farm, we will continue to own our farm and have no immediate plans to retire, but we also want the next owner of our land to farm it too. Here is where things get really exciting. 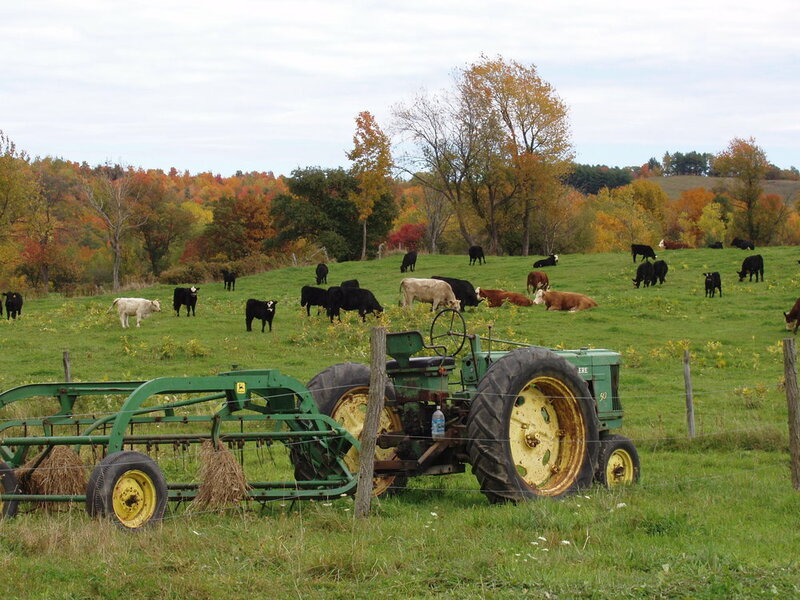 ASA has been awarded a grant by the United States Department of Agriculture (USDA) that will provide 50% of the funds required to purchase the conservation easement. The even better news is that ASA has already secured the majority of matching funding needed. Now ASA is launching a public campaign to raise the final funds to protect this productive and beautiful land. We are asking you to help us raise the remaining $53,000 needed to conserve the farm by making a donation today. Ensuring the land is available for farming forever is incredibly important to us. We feel strongly that this is the right thing to do. A commitment to healthy, sustainable agricultural practices has always been at the heart of Lewis Waite Farm. Conserving the farm is an extension of our commitment to sustainability. Conserving the farm protects grazing land, provides wildlife habitat, protects water quality and preserves these beautiful farmscape views for the community. Removing development rights on the land forever will hinder sprawl and will make it easier for the next generation of farmers to farm. We simply can’t allow our beautiful, productive farm to be subdivided or transformed by any kind of development. We feel so strongly, that we have committed to donating 40% of the easement value. As a customer, we know you value having a source of fresh, local food that is grown sustainably. You’ve already demonstrated your commitment to the farm’s success. We are grateful for your loyalty and we are counting on you to be our partner in ensuring the farm’s future as a source of local food for generations to come. We are asking you to “buy a share” in the farm’s conservation by making a tax-deductible contribution today and partnering with ASA to protect it forever. Future generations will have you to thank when they enjoy locally grown foods as you do today from this land that you helped conserve! Get involved! If you have a local event to promote, a service to offer, or a recipe to share, get in touch via newsletter@clintonhillcsa.org. We look forward to hearing from you!